How can you handle the recoil of ultra-powerful sidearms? In the near future, advances in warm superconductors, capacitors, and battery technology has led to railgun or coilgun projectile launching devices of enormous power. The energy storage (battery or fuel cell) can be carried separately and connected via a cord, but the superconductive rail that actually does the launching is hand-held and aimed like a small sidearm. The amount of energy given and the weight of the projectile can be varied, even on a shot-by-shot basis. The system is limited not by how powerful the gun can be, but by how much power the wielder can handle! Note that unlike a rocket launcher, the nature of the system demands that the recoil is felt directly by the gun itself. Suppose the near-future technology has advanced to the point indicated in order to build the weapons described, plus perhaps a little more. Other areas of science will have advanced as well, and you can be flexible on this, as long as it seems like roughly the same time frame needed for the proposed advances. In what ways might a soldier be able to cope with such a powerful weapon’s recoil? What is the effective limit to how much power he could use in weapon that one person carries and easily points? This question was developed as part of this Lesson and was suggested from a draft question by user Redacted Redacted which he subsequently decided to not proceed with asking. Recoil is a function of the momentum of a fired round, and is proportional to mass and velocity of the projectile. Kinetic energy of the projectile, on the other hand, is proportional to mass and velocity squared. For a conventional firearm, the expansion rate of combusting gases puts a limit on practical muzzle velocities. But a railgun can effectively convert electrical energy directly into kinetic energy (with losses), and has no such limitation. So, the solution is simple: Use a very light round, and maximize its muzzle velocity while minimizing its mass. A typical 7.62x51mm rifle load fires a 10g projectile at a velocity of 833m/s, and represents a practical upper limit for rifle recoil. Scale down the projectile size to 2.5g, and the velocity up to 3,332m/s, and the momentum remains the same while the muzzle energy increases by a factor of four. This is a very light round, about as massive as a .22LR, so it may have difficulty retaining energy at range. But its sheer velocity more than makes up for it, as it now has a maximum muzzle energy of over thirteen kilojoules. The main problem now is that fast-but-light rounds have a tendency to overpenetrate (pass through the target rather than transferring their energy), but we have a solution for that too. Simply adjust the muzzle energy for the given task. At long range, use the full-power shot to get a flat trajectory and maximize accuracy. Against armored targets, also use the full-power shot to maximize armor penetration. But at short range, against unarmored or lightly-armored targets, you can step down the muzzle energy and step up the rate of fire. If the example from before is stepped back down to 417m/s, each projectile has 1/64 the muzzle energy of the full-power round, and has mass and velocity comparable to a .22LR. That's not very impressive, but you can now increase your rate of fire by a factor of 64, while still drawing just as much power as before from your power source. Note that overall recoil will increase by a factor of 8, but since each individual shot will have much less recoil it will be more of a strong push than a bone-shattering shock. For reference, the American-180 submachine gun had a rate of fire of 20 rounds per second and is extremely easy to control. A much higher rate of fire should be practical in a rifle configuration. But there's one more trick we can do. A bipod will help immensely. Weapons as large as 20mm anti-tank rifles are manageable with a bipod and suitably padded buttstock, and this is the common configuration for light machine guns. A rifle with 7.62 recoil like I described may be difficult to handle on full-auto from a standing position, but a machine gun in the same caliber can be comfortably fired in accurate bursts. But if possible, set the rifle down on a dedicated tripod mount. Now that same machine gun can accurately fire on full-auto as fast as the weapon's mechanism can sustain with no recoil imparted on the shooter. Your weapon's firepower is now only limited by what the recoil system of the tripod can handle. Even a simple metal tripod with no special recoil system can sustain far greater recoil than the operator's shoulder and will allow us to scale up the muzzle velocity, rate of fire, or both as needed. Design a suitably portable tripod, and every rifleman in your army can have the firepower of an MMG combined with an anti-material rifle combined with the world's angriest submachine gun at his disposal. Your challenge is figuring out how to carry enough ammo. I'm surprised that nobody has mentioned this so far: the attraction of railguns isn't just that they can reach higher muzzle velocities; it's how they do so. A railgun can give its projectile a continual acceleration as long as it's between the rails, whereas a chemical-propellant gun has most of the push being delivered initially, dropping off as the gas expands. A railgun could therefore reach the same muzzle velocity as a conventional firearm with more manageable recoil, because it's a relatively low push over a longer period of time, rather than a solid kick that tapers sharply. Guns that use shock-absorbers basically do this, using the initial kick to compress a spring or piston that then delivers the recoil to the shooter as a sustained force rather than a short impulse, which demonstrates that it does help. To approach the problem from the other side, if you take the maximum instantaneous force that a shooter can reliably control, you'll find that a firearm, by virtue of how the propellant expands, will hit this limit for a brief moment and then drop away as the gas expands down the barrel. A railgun, on the other hand, could stay at this limit for the entire time that the round is inside the barrel. Applying the same force for more time means that your round will reach a higher velocity. Look at today's high energy weapons systems to see how to do it. Yes, it means a big don't-stand-here zone, although it could be used indoors, like the RPGs that expel an inert reaction mass rather than flame. The reaction mass must be expelled, otherwise it simply turns a sharp kick into a more prolonged shove--still too much for the operator to withstand. I do agree you have substantially increased your ammunition weight but a too-heavy round is better than a round that can't be fired at all without killing the operator. Note that you could somewhat reduce the logistics problem by making the weight water--and allow field-loading of the water. Since we're looking at dealing with huge recoil we could look at something today that needs to deal with huge recoil: Artillery. Artillery pieces use something called a hydro-pneumatic recuperator (I believe the American terminology for this is different but I don't know what it is) It's essentially a specialized shock absorber that uses a hydraulic cylinder to absorb the recoil and a pneumatic system to return it to position. The big problem with this is weight which might necessitate development of a completely pneumatic system like a gas charged shock absorber. Or the development of the coil gun might have gone hand in hand with that of an exoskeleton that makes the additional weight a moot point. The bullet is leaving your gun in one direction, making it kick back the other direction. Instead, make the gun fire two projectiles, one at the target, and another in the opposite direction. As long as your friends aren't behind you, there is now a perfect no-recoil situation. If you want to minimise the damage behind you, make it a very heavy projectile, while making the forward facing projectile very light. The forwards bullet will zip off, while the heavy one will only go ~10m behind you. Again, this counter bullet could be optional—only used when you really need fire power. You might only need one or two heavy projectiles, and reuse them (assuming 1-2 shots will do all the damage you need to end the fight, or that you're under cover). Just make sure the counter bullet goes over your shoulder, or around you, but not through you. Current "chemical rifles" use shock absorbers (springs and padded buttplates on the shoulder stocks) plus extra mass to counteract the recoil. Electromagnets might be able to counter the recoil from a railgun. In addition to the "weapon-side" improvements by Catgut, I would propose the idea of exoskeleton. Actually it was my fist idea after reading a question and is borrowed from one of StatCraft books (however I do not know which one, it is long time ago I read this). In the book is explained, that a person should take a certain stance before firing a gun. The armor "recognize" this stance and helps to compensate for the recoil (by taking most of recoil to suit itself instead of handing this recoil to the user). I do not know whether it was done using some on-demand self-hardening material (e.g. artificial muscles), hydraulics (which there were surely a lot of), or just a plain mechanical locking of parts together. Thus my proposal would be a such: give your soldier an exoskeleton. It would be up to your story if it would be mariner-style full-coverage suit, or light version like heavy-weight lifter used by Ellen Louise Ripley in one of Alien movies. So I imagine this skeleton working in something like this: Soldier gets to a firing stance and raises weapon to shoulder (could have a hollow for slitting a back of the gun into, for better transmission of recoil). Exoskeleton recognizes this pattern, locks certain joints (like shoulder joint, belly-to-legs joint, legs joints, basically everything needed to transfer recoil from gun to suit to ground), and the recoil goes to the rigid exoskeleton, instead to a soft meat of soldier and ends in a ground. The locking mechanism must be really fast to engage in split second and be a freely moveable right after firing a bullet. This might be solvable with artificial muscles. Recognizing mechanism is also quite tricky - I am not a weapon proficient myself, so I cannot tell if any general pattern exists (I imagine that weapon at shoulder might be, plus some others). Anyway if it does or does not, the user might enforce the suit to strengthen itself. The order to enforcing might be as trivial as button on a gun, or a complex as a kind of neural interface. I would prefer latter due to the times required for actuation of locking-mechanism. The exoskeleton-related problems are quite known, however one of the biggest - the power requirements - might be solved by question itself due to the power store capable to sustain a railgun. And if you could afford a railgun or something similar, an exoskeleton giving your valuable soldier protection, possibility to bear increased firepower and several other advantages (sensors, tactical computers, might work as a hazmat suit, ...) seems as a good investment too. You could try transferring the recoil, like they do with the Kriss Vector rifles, which uses a unique method of taking most of the recoil energy and sending it down, then back up, instead of back toward the shooter. From the video, you get a little bit of back, then a sharp down and then a sharp up. Obviously this is a traditional powder gun, and not a railgun, BUT you may be able to do something similar with a railgun by having the recoil push the barrel back, and use that action to drive something down, moving the energy in another direction. The fundamental difference between railgun technology and explosive cartridges is the fact that railguns accelerate their projectile over a longer time versus (near) instantaneous acceleration given by the cartridge. What this means is that there can be a lower acceleration over a longer time to achieve the same final velocity. With the lowered acceleration, the recoil force is drastically reduced with the drawback that it must be withstood for a longer time (steady aim is super important). You could have a counterweight that went around the barrel, and slid down on its own rail. When you pulled the trigger, the counterweight would be shot first but with less acceleration than the main projectile. As the counterweight approached the end, the main projectile would accelerate, and the counterweight would stop and reverse, taking the recoil with it (the reverse acceleration of the counterweight would be such that it balanced most of the acceleration of the projectile). Once the projectile leaves the barrel, the counterweight reverses its acceleration again until it runs out of rail. You then only need to absorb the recoil of the counterweight, which is more spread out over time, so easier to deal with. As was explained to me in a college-level physics class, recoil is essentially an elastic collision between the accelerated mass of the projectile and the accelerated (in the opposite direction; recoil) mass of the weapon. This means mass of the projectile * acceleration of the projectile = mass of the weapon (everything BUT the projectile) * acceleration of the weapon (recoil). The Springfield rifle used by US Marines during WW II had the ability to launch grenades. You chambered a blank round and added an adapter to the end of the barrel, mounted the grenade in the adapter, pulled the pin (the adapter keeping the fuse / handle closed) then pointedly DID NOT put the weapon against your shoulder; triggering the round would break your collarbone. The increased mass of the projectile, even with the reduced acceleration from the blank round, still increased the recoil to more than a human body could tolerate. The same rifle could fire .30 caliber rounds all day, causing some fatigue and, with ENOUGH rounds, pain to the shoulder area. But a soldier couldn't tolerate ONE grenade launched from the shoulder. As has been thoroughly discussed, makInge the projectile lighter will reduce one side of the equation, thereby reducing the other. Another approach is to pointedly weigh down the weapon. There's a reason why a common rule of thumb is to make the weapon at least 100 x the mass of the projectile. That ensures that the recoil (acceleration of the weapon) is no more than 1 / 100th the acceleration of the projectile. Putting a massive shock absorber on it reduces the JERK on the weapon, ensuring that you have a longer-duration, lesser-intensity recoil instead of a hard, short-duration one, reducing fatigue and potential injury to the operator. That can make it easier to brace against the recoil, both for man-portable weapons and otherwise (artillery, as an example). But you still have the fact that mass (projectile) * acceleration (projectile) = mass (weapon) * acceleration (weapon). There is no ignoring that simple fact of physics. Bazookas and such (recoilless weapons) have the propellant working against the air behind the weapon, not against an enclosed barrel. Why did they create recoilless weapons? An closed-barrel weapon would have a greater muzzle velocity, yes. But the recoil would injure, if not kill, the operator. For this reason, I have a hard time with any sci-fi which has man-portable railguns. The weapon would have to be so heavy (not just for the power supply / railgun mechanism) or the projectile would have to be so light that it would be impractical. In Starship Troopers (the book, not the hideous movie with the same title), the Mobile Infantry wore heavy, powered "suits" which, among other things, carried more weaponry and munitions than a person could carry AND could absorb levels of recoil / impact no human could survive. Such a suit, or some kind of heavy, powered exoskeleton, might be able to take the recoil of a railgun. But you're pointedly having machinery take the recoil, not the operator. Failing that, the weapon needs to sit on the ground (or deck), preferably anchored, so the operator doesn't have to take the recoil. Exoskeletons- light as the system seen on 'Elysium' or full body armour are one answer. Another is gravitic recoil compensation, this being more advanced tech. 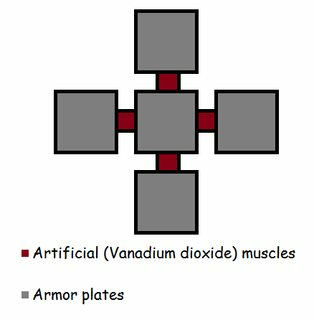 When not worn by the user, it's essentially a sheet of small plates, connected to each other by Vanadium dioxide fibers, contained in a heat sealing aerogel. Whenever it's needed, the artificial muscles are able to contract in a specific area "hardening" it (it's like a local Rigor mortis), among many uses, this enabled the user to harden the suit in a way, that when the weapon fired, the majority of the force got distributed across pre-determined points. The partial hardening could be quickly canceled, enabling the user to point at a different target. In this way, it is possible to create an exoskeleton, that doesn't hinder movement. What are the advantages of a coilgun v.s. a railgun?